Check Connection is a nationally based company that works with collection agencies, re-presentment companies and a network of hundreds of prosecuting attorney’s offices across the country. For more information about Check Connection or FollowThrough contact us at 800-574-3803. Check Connection, Inc. is a sister company to BounceBack, Inc. 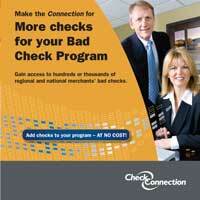 Since 1994, BounceBack, Inc. has been an integral part of prosecutors’ bad check diversion programs across the country. BounceBack works with a larger and more diverse number of jurisdictions than any other company. 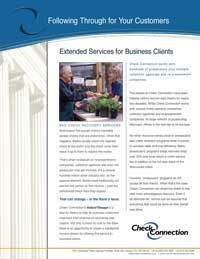 Check Connection grew out of this experience, letting merchants take advantage of the extensive infrastructure and knowledge base. We have earned our high standing in the industry as the company that stands for Integrity and Results. Our customer loyalty is the highest in the industry and our restitution rates are far superior to any company of our type. No matter how you measure it, BounceBack is the market leader in bad check diversion programs.What that means for you is assurance that your bad checks will be handled properly. It also means that Check Connection can help return more money to your business. To learn more about what BounceBack offers, visit Bouncebk.com/bracket. 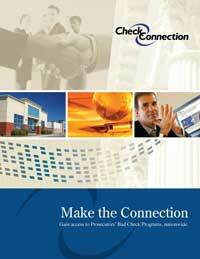 For more information on Check Connection, download our informational brochures. NOTE: These materials are in PDF format and require Acrobat Reader to download and print. If you don't already have Adobe Acrobat Reader installed on your computer, download for free now by clicking on the red adobe icon. You will be linked to the Adobe Reader site and giveniinstructions for downloading and installing.